UltraCart's integration makes it easy to sell on eBay to manage the full life-cycle of listing products and converting them to orders. 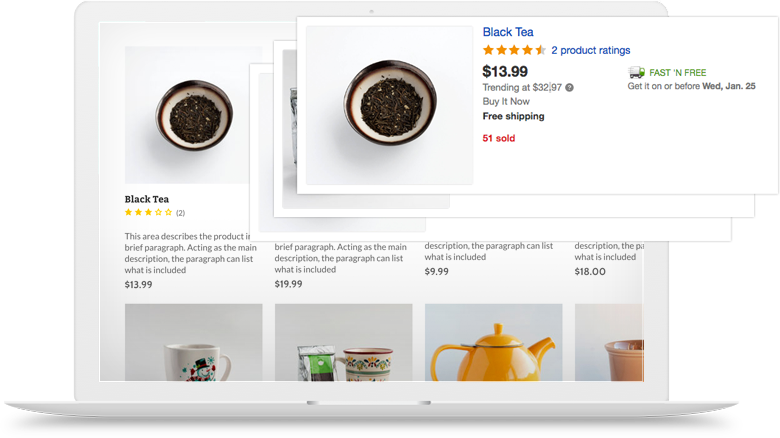 Why not combine the reach of eBay with the efficiency of an online StoreFront. UltraCart can help you set up an ecommerce Store that effectivly integrates with eBay, so you can enjoy the best of both services. UltraCart can handle the complete lifecycle of product sales on eBay from listing, inventory/pricing updates, order downloads, and shipment confirmation transmission. Quickly link your eBay and UltraCart accounts using their easy to configure API credentials. Decide which items that you want to sell on eBay and activate their listing. Merchants sellings common products on eBay can take advantage of our Marketplace Analysis which automatically tunes the pricing of your offers to stay as competitive as possible.